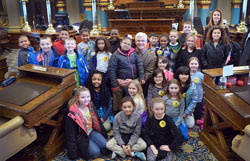 LANSING, Mich. — State Sen. Mike Shirkey met in the Senate with students from Sharp Park Academy in Jackson. Shirkey, R-Clarklake, read to the students and reminded them, “If you learn how to read, you can do just about anything.” He also talked about the importance of parents and teachers promoting reading during March is Reading Month. Note: Watch the video of Shirkey reading to students and addressing the importance of March is Reading Month. To view other Shirkey videos, click the Video link, at right.